Photo: Phillips Folly, (William B. Phillips House) ca. 1831, 227 Sutton Street, Maysville, KY. Listed on the National Register of Historic Places in 1978. Photographed by Gregg Hume (own work), 2010, [cc-by-3.0 (creativecommons.org/licenses/by/3.0)], via Wikimedia Commons, accessed October, 2015. 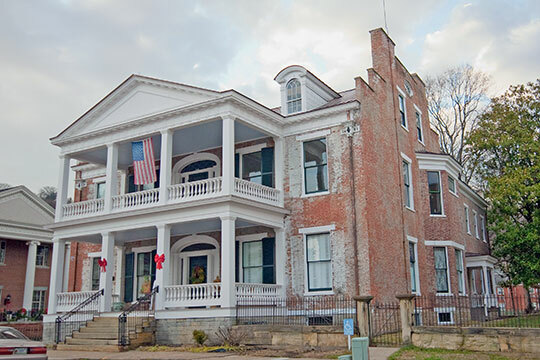 Mason County administrative offices are located at 27-31 West 3rd Street, Maysville, KY 41056; phone: 606-564-3341. Mason County is a relatively small county located in northeastern Kentucky on the Ohio River between the metropolitan areas of Cincinnati, and Ashland-Huntington. The earliest settlements in the area were Washington in 1785 and Limestone and Charleston in 1786. Shortly thereafter, the residents petitioned for a division of Bourbon County, and Mason County was created. Native Americans had long occupied the area and with the arrival of new settlers there were occasional skirmishes. Despite these conflicts, the settlement of Limestone quickly became a busy port on the Ohio River. In 1789 thirty flatboats per day were arriving in Limestone. By 1793 the original inhabitants had withdrawn and a stream of settlers began to pour into the area. A post road was constructed in 1794 which connected Limestone with the Bluegrass area and with Pittsburgh. With this improvement regular mail service became available. Early settlers included Scotch-Irish, Germans, and English people who came down the Ohio River from source areas largely in Virginia. Most were intent on earning their living by raising crops and livestock. Limestone was a major disembarkment point for settlers moving south into the Bluegrass. In 1790 Washington already had a population of 460, second only in size to Lexington, among the settlements of Kentucky. By 1810 Washington had grown to 815, while Maysville's population reached 335. In that same year there were seven communities located in Mason County with a combined population of 1,388, including Washington, Maysville, Mayslick, Charleston, Germantown, Lewisburg, and Williamsburg (now Orangeburg). Slavery was a fixture in Mason County from the earliest settlements. There were 229 slaves in 1791. By the 1860s Mason County was 12th among Kentucky's counties in total slave population. People in the county were divided over the slavery issue and fought on both sides during the Civil War. In the past war years freed blacks settled in several of the county's towns where their descendants are still found today. Roads were improved, rail connections were completed, and Mason County continued to grow and prosper. By the 20th century the strong agricultural base with tobacco as the dominant crop, was giving way to a more diversified economy, with Maysville becoming the focal point of manufacturing, trade, and services. Today Mason County, with its primary urban focus of Maysville, is the dominant growth center in a seven county trade area of Kentucky and Ohio (serving Mason, Robertson, Bracken, Fleming, and Lewis counties in Kentucky, and Adams and Brown counties in Ohio). The city's population is estimated at 9,000 and the county's total at 17,140. The county's economy is highly diversified and continues to reflect a strong agricultural component. Mason County Agricultural Development Council and the Mason County Agricultural Extension Office, A Comprehensive Farm Plan for Mason County, Kentucky, 2001, revised 2007, www2.ca.uky.edu, accessed October, 2015.